Lock in a great price for Green Gables Inn, A Four Sisters Inn – rated 9.4 by recent guests! Very well located! We had a very comfortable stay and would stay there again when the opportunity arrises. Ambience and staff. The weather was rainy and windy and the lovely rooms and fireplace made it vert cozy. One could not help but relax and enjoy. The location was excellent, and the view was beautiful! The breakfast was a lovely surprise too. This place was very charming! Pancakes were Awesome. Bed very comfortable. View of the Ocean are breathtaking. Fireplace. Wine and appetizers. Jacuzzi. Location. Parking. We love to run or walk and we were in walking distance of wherever we wanted to go. Beautiful, Classic Bed and Breakfast with amazing sea views. Beautiful location right across from the ocean. Very nice homey feel. Green Gables Inn, A Four Sisters Inn This rating is a reflection of how the property compares to the industry standard when it comes to price, facilities and services available. It's based on a self-evaluation by the property. Use this rating to help choose your stay! 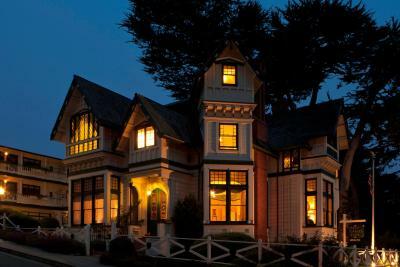 This Pacific Grove bed and breakfast is on Monterey Bay, just steps from the Monterey Bay Recreational Trail. The inn provides a full breakfast buffet and afternoon wine and hors d'oeuvres. Green Gables Inn features a gas fireplace in each guest room. The private bathroom has 2 plush bathrobes. Select rooms have bathtubs with jets, or partial ocean views. Water, coffee and tea are available throughout the day at the Green Gables. Concierge services and evening turn-down service with chocolates are also available. The Monterey Bay Aquarium and Cannery Row are only minutes from the Green Gables in Pacific Grove. The Presidio Museum is also nearby. 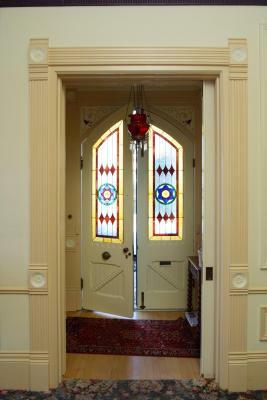 When would you like to stay at Green Gables Inn, A Four Sisters Inn? This cozy room features an ocean view and access to a shared bathroom. 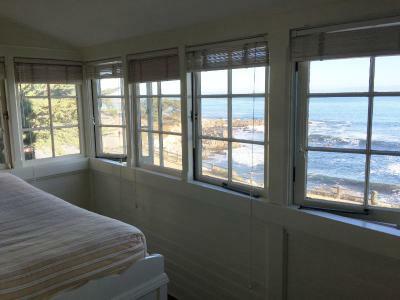 Also known as the "Deluxe Queen Guestroom" this room features a small private bathroom and view of the Monterey Bay from a window seat in a gable loft. Also known as the "Queen Guestroom", this room features a gas fireplace, window seat with a view of the grounds and a private bathroom with spa tub and shower combo. Also known as the "Carriage House King Spa Guestroom", this suite offers a seating area with partial bay views, a gas fireplace and an private bathroom with over-sized spa bath and separate shower. Also knows as the "Lacy Suite", this room offers a separate seating room, a TV a jetted tub and shower combination. Also known as the "Garrett Guestroom", this room features partial bay views, a small sink in the guestroom and a shared bathroom. This guest room features a gas fireplace, window seat with a view of the grounds and a private bathroom with spa tub and shower combo. House Rules Green Gables Inn, A Four Sisters Inn takes special requests – add in the next step! Any additional adults are charged USD 25 per person per night when using existing beds. Green Gables Inn, A Four Sisters Inn accepts these cards and reserves the right to temporarily hold an amount prior to arrival. If canceled before 7 days prior to arrival, the property will refund the deposit minus a cancellation fee. Guests must present the same credit card that was used to make the reservation at the time of check in. The bed was a bit hard. Also, we booked on booking.com selecting the king room, and got a Queen room. We were told that is what happens when people book through third party sites and that it couldn't be changed. Cover the eggs. They were cool by the time I sat down to eat. That is about it! Style of building, size and comfort of bedroom suite. The noice from ground floor ventilation system was pretty bad. It was located at our bedside. Our feet could feel the vibration from it and it was still running at 11pm on of the day we stayed. I didn’t know what was the problem until I made emergency call to the oncall staff who called the lower level people and asked them turned off the system. Great location, very friendly staff, very nice breakfast. Room dated and tired, blinds didn’t fit windows leaving gaps. Fruits are fresh, coffee is excellent, oatmeal is cooked just right! Excellent scrambled eggs! Loved raspberries and roasted almond for topping. And beautiful oceanfront or Oceanview table setting, comfortable bed, super nice staffs!